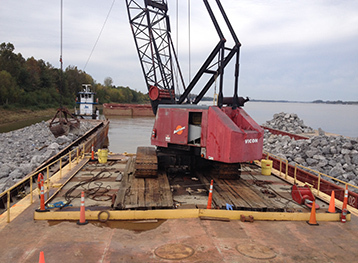 Owner: River Services Co., Inc.
Aquarius Marine was subcontracted by River Services Co., Inc. to assist in the salvage of a fully loaded rock barge that sank on October 27, 2013 at Lock and Dam 52, on the Ohio River between Paducah, Kentucky and Brookport, Illinois. 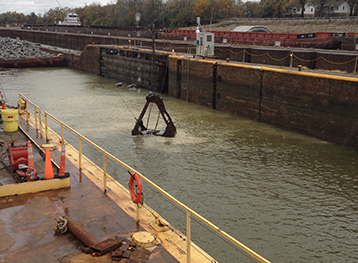 The barge sank in the locks’s smaller 600 foot chamber, which is scheduled to remain closed for at least one week and is creating a major delay to river traffic. 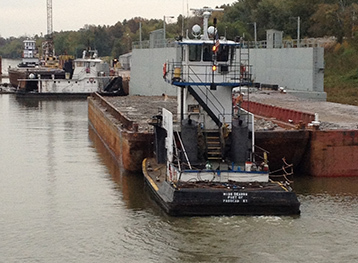 Aquarius Marine was responsible for clearing and removing the large rocks from the fully submersed barge deck and out of the lock chamber. 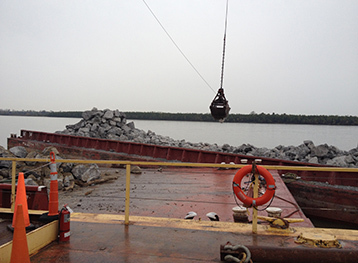 In all, Aquarius Marine exceeded schedule expectations by removing approximately 1,300 tons of rock in less than six days.